H.E. 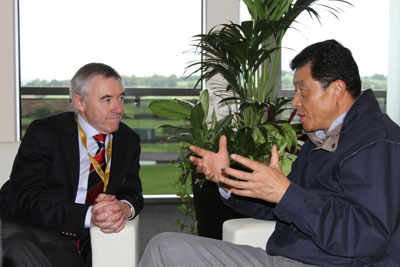 Mr. Liu Xiaoming, Chinese Ambassador to the UK, visited Wales from 30 September to 2 October, 2010 at the invitation of the Welsh government. During his visit, Ambassador Liu met with the Rt. Hon Carwyn Jones, First Minister of Wales; and Ieuan Wyn Jones, the Deputy First Minister. When he met the Rt. Hon Carwyn Jones, First Minister of Wales, Ambassador Liu said that Wales was the first place beyond England he visited since his arrival in the UK. He was deeply impressed by the beautiful landscape, simple and hospitable people of Wales. Ambassador Liu said that in recent years China and Wales have been strengthening relationship; and since the establishment of the Assembly Government, the two sides have made great achievements in many ways, which has brought about new opportunities for China and Wales to further develop their relationship. He stated that China is ready to further expand cooperation with Wales in personnel exchange, economic and trade links, scientific and educational cooperation and many other areas. The Rt. Hon Carway Jones welcomed Ambassador Liu’s visit to Wales and his presence at the Ryder Cup. He said that Ryder Cup was not only a great event but also a great chance to let the whole world know Wales better. He told Ambassador Liu that Wales attaches great importance to its friendship with China in all areas. He looks forward to visiting China in the near future. When he met with Ieuan Wyn Jones, the Deputy First Minister, Ambassador Liu said that Wales started contacts with China many years ago, and Cardiff, the capital of Wales, became sister cities with Xiamen City of China in 1983, which was the first pair between China and the UK. Recently, Wales has had a close relationship with Chongqing Municipality, and achieved many results in various areas. Ambassador Liu said that the Chinese Embassy in the UK is ready to facilitate cooperation in economy, trade, culture, education, science and technology and other areas between the two sides. Ieuan Wyn Jones said Wales attaches importantce to its exchanges in all areas with China. He said that China has been developing at a high speed in recent years, which attracts the whole world’s attention. He pointed out that Wales is willing to take this opportunity to develop closer and more comprehensive cooperation with China. Mr. Jones also expressed the Welsh people’s congratulations on the 61st anniversary of the People’s Republic of China. During his visit, Ambassador Liu attended the opening ceremony of the Ryder Cup, a world-class golf competition, at the city of Newport, Wales. The celebration gala was held at the Millennium Centre in Cardiff that evening. When Ieuan Wyn Jones, Deputy First Minister, announced the presence of Jose Manuel Barroso, President of the European Commission, and Chinese Ambassador Liu Xiaoming, the audience responded with a warm round of applause.